Titled: encampment by the water. Edwin Longsden Long, RA (Royal Academy) was an English genre, history, biblical and portrait painter. He was born in Bath, Somerset, the son of E. Long, an artist (from Kelston in Somerset), and was educated at Dr. Viner’s School in Bath. Adopting the profession of a painter, Long came to London and studied in the British Museum. He was subsequently a pupil in the school of James Mathews Leigh in Newman Street London, and practiced first as a portrait artist painting Charles Greville, Lord Ebury and others. Long made the acquaintance of John Phillip RA, and accompanied him to Spain, where they spent much time. Long was greatly influenced by the paintings of Velasquez and other Spanish masters, and his earlier pictures, such as La Posada'(1864) and Lazarilla and the blind beggar'(1870), were painted under Spanish influence. His first important pictures were The Suppliants'(1872) and The Babylonian marriage market (both subsequently purchased by Thomas Holloway). 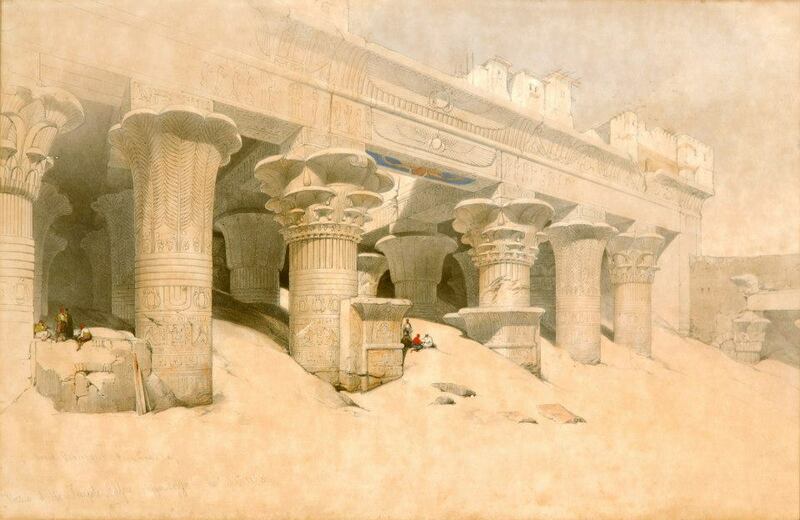 In 1874, he visited Egypt and Syria, and subsequently his work took a new direction. 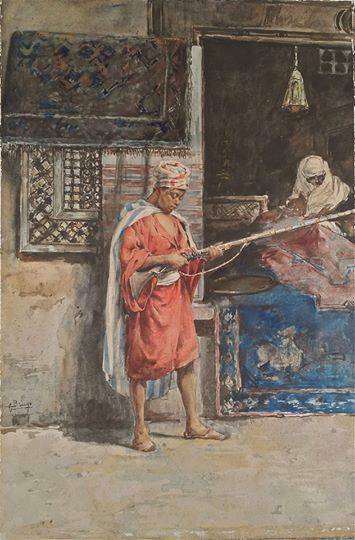 He became thoroughly imbued with middle-eastern archaeology and painted Oriental scenes such as The Egyptian Feast (1877) and The Gods and their makers (1878). Long was elected an associate of the Royal Academy in 1870 and an academician (RA) in 1881. His pictures always attracted attention and his Diana or Christ? (1881) greatly enhanced his reputation at the time. His pictures suited the taste and appealed to the religious sentiment of a large portion of the public, and their popularity was increased by a wide circulation of engravings. He consequently determined to exhibit his next pictures in a separate gallery of his own in Bond Street, London and there in 1883, and the following years, his Anno Domini’and Zeuxis at Crotona met with great commercial success. Long died from pneumonia resulting from influenza, at his home, “Kelston” in Netherhall Gardens, Hampstead, on 15 May 1891, in his sixty-second year. He was buried in West Hampstead Cemetery. The will signed by him on the day of his death was the subject of a lawsuit, to which his relatives were parties, but the matter in dispute was amicably settled. Long married a daughter of Dr. William Aiton, by whom he left a family, of whom a son, Maurice Long, was killed in a railway accident at Burgos in Spain on 23 Sep. 1892. Besides the “Edwin Long” Gallery in Old Bond Street, a number of his pictures was collected together after his death, and formed the nucleus of a gallery of Christian Art, which replaced the works of Gustave Doré in the well-known gallery in New Bond Street. Long had considerable practice as a portrait painter but his success in that line was not conspicuous, although he obtained high patronage and very large prices. He painted for the Baroness Burdett Coutts (his chief patron) portraits of herself, her friend Mrs. Brown, and Henry Irving. Among other portraits of his latter years were a memorial portrait of the Earl of Iddesleigh, of which he painted a replica for the National Portrait Gallery, portraits of Cardinal Manning (perhaps his best effort in this line), Samuel Cousins, Sir Edmund Henderson and others. According to art historian Lionel Cust, “In his earlier works Long showed great power and thoroughly deserved his success and popularity”, but added that his later works “suffered from a continual repetition of types which resulted in monotony”. Wifredo Oscar de la Concepción Lam y Castilla was born December 8, 1902, in Sagua la Grande, Cuba. In 1916, his family moved to Havana, where he attended the Escuela de Bellas Artes. During the early 1920s, he exhibited at the Salón de la Asociación de Pintores y Escultores in Havana. In 1923, Lam moved to Madrid, where he studied at the studio of Fernando Alvarez de Sotomayor, the Director of the Museo del Prado (and a teacher of Salvador Dalí). In 1929, Lam married Eva Piriz, who died of tuberculosis two years later, as did their young son. This tragic event may have contributed to the dark and brooding appearance of much of Lam’s later work. In the early 1930s, the effects of Surrealism were evident in Lam’s work, as was the influence of Henri Matisse and possibly Joaquín Torres-García. In 1936, a traveling exhibition of the work of Pablo Picasso shown in Barcelona, Bilbao, and Madrid proved inspirational to Lam both artistically and politically. He moved to Paris in 1938, where Picasso took him under his wing and encouraged his interest in African art and primitive masks. During that year, Lam traveled to Mexico, where he stayed with Frida Kahlo and Diego Rivera. Lam’s own multicultural heritage (son of a Chinese father and a mother of mixed African, Indian, and European descent) and his involvement with Santería, a religion rooted in African culture, would soon become integral to his work. By the late 1930s, Lam was associated with the Surrealists. He had his first solo show at the Galerie Pierre Loeb in Paris in 1939, and his work was exhibited alongside Picasso’s at the Perls Galleries, New York. During World War II, Lam spent most of his time in the Caribbean, along with André Masson, and André Breton, whose poem Fata Morgana Lam illustrated in 1940. Lam eventually made his way back to Havana in 1941. His first year in Cuba marked a watershed in his artistic development; he was introduced to the theories of Carl Jung, and by the end of 1942 he had begun his powerful painting Jungle. Lam’s exploration of mythic images paralleled that of his contemporaries in New York, the Abstract Expressionists, though Lam used specific subject matter. 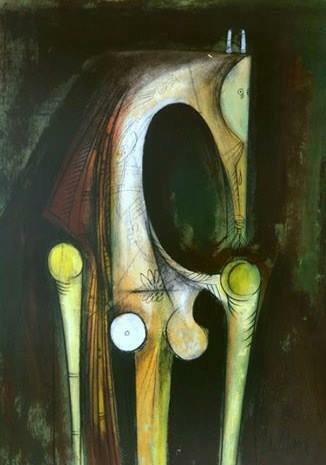 Lam created his own style by fusing Surrealism and Cubism with the spirit and forms of the Caribbean. Between 1942 and 1950, the artist exhibited regularly at the Pierre Matisse Gallery in New York. His second marriage, to Helena Holzer in 1944, ended in divorce in 1950. In 1946, after a four-month stay in Haiti, Lam returned to France via New York. He traveled extensively until 1952, then settled for three years in Paris before resuming his travels again in 1955. In 1960, Lam established a studio in Albisola Mare, on the Italian coast. The winter of that year he married Swedish painter Lou Laurin, with whom he would have three sons. In 1964, he received the Guggenheim International Award, and in 1966–67 there were multiple retrospectives of Lam’s work at the Kunsthalle Basel; the Kestner-Gesellschaft, Hannover; the Stedelijk Museum, Amsterdam; the Moderna Museet, Stockholm; and the Palais des Beaux-Arts, Brussels. Lam died September 11, 1982, in Paris. 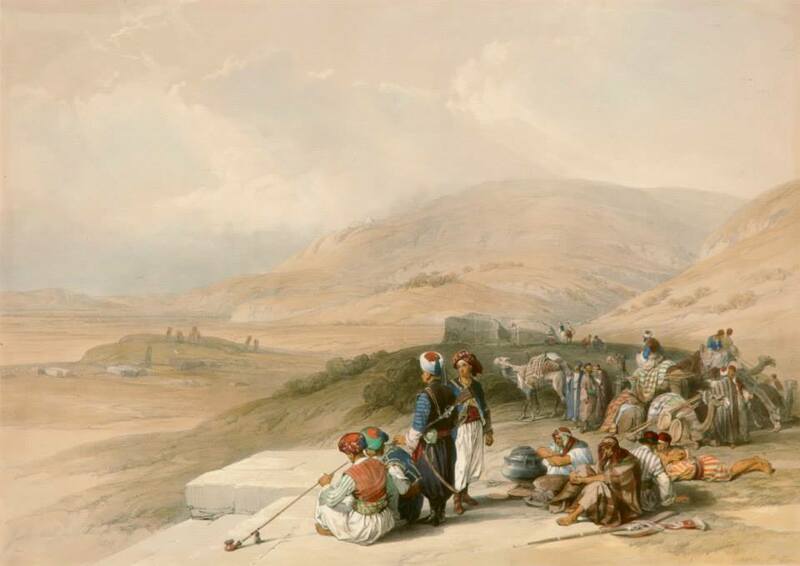 ARABS AT JACOBS WELL , Farhat Art Museum Collection. 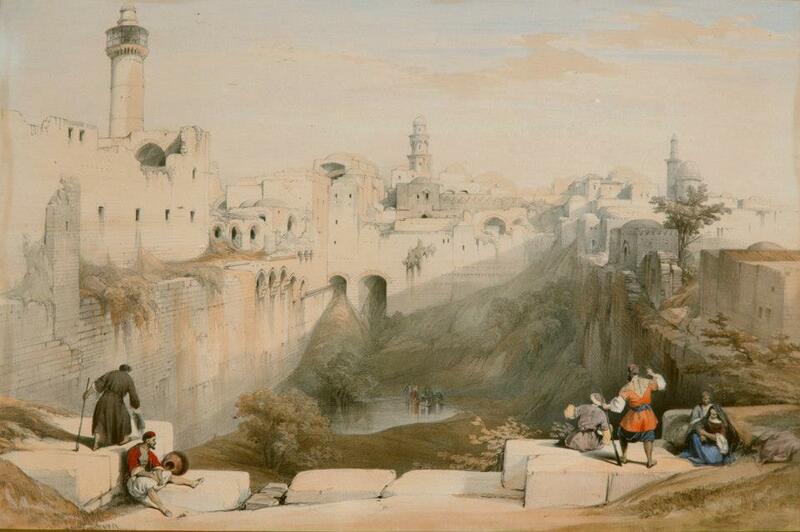 Pool of Bethesda – Jerusalem , Farhat Art Museum Collection. 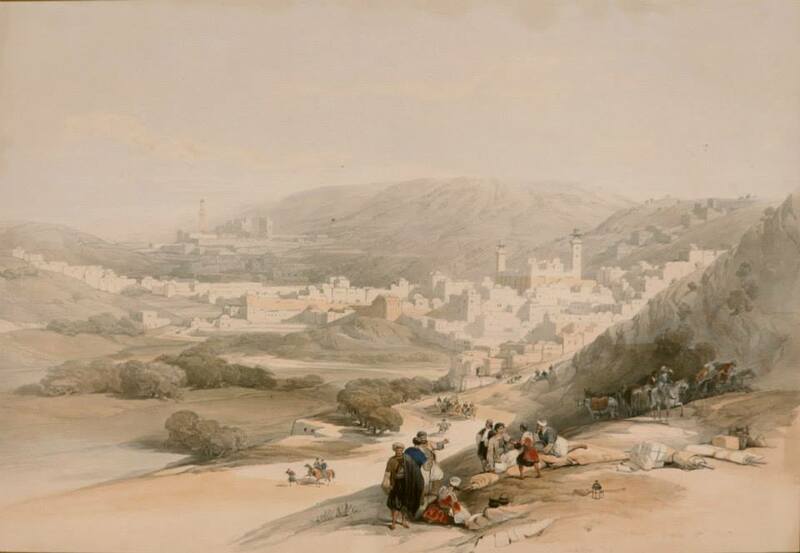 Hebron, March 18th 1839 ,Farhat Art Museum Collection. A painter whose reputation was made by the paintings he did of exotic lands, David Roberts was born and raised in Stockbridge, near Edinburgh, Scotland. His father, John Roberts, was an impoverished shoemaker, who, with his wife Christine, tried to support five children in a small house on Duncan’s Land by the Water of Leith. The house remains standing in the 21st century. Only two of the children lived to maturity. Roberts’ mother encouraged his obvious art talent, and allowed him to sketch in charcoal on the white washed walls of the house. At the age ot twelve, he apprenticed for a summer to Gavin Beugo, a decorator from Edinburgh, and this training, demanding fifteen hours a day, was very helpful to the future artist. From Beugo, he learned interior decorating techniques of marbling and graining wood, trompe l’oeil panneling, and techniques for painting large areas very quickly. At the end of the summer, Roberts was offered a job painting scenery for a circus, and accepting this offer set the course for the next part of his life. He spent 15 years doing theatre set designs throughout Great Britain, often working with Clarkson Stanfield. This collaboration was so successful that within a few years they were much sought after and could name their terms financially. However, much stress was associated with the work including the alcoholism of his wife who suffered from loneliness and had to be sent back to Scotland, and the destruction of some of his sets by a jealous competitor. By 1830, Roberts had abandoned the theatre and moved to London with a determination to become an easel painter. Much of the distinguished reputation he subsequently achieved was linked to the visual images he created from his extensive travels. 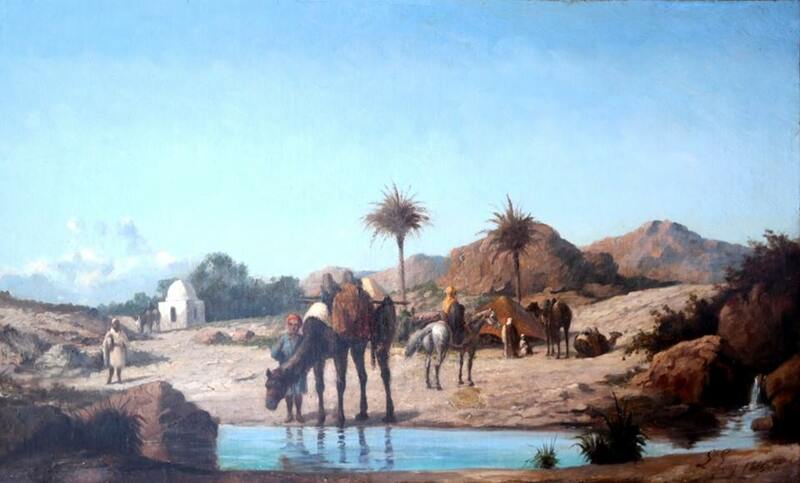 In 1832, he traveled to Spain, Morocco, Tangiers and Tetuan in Africa, and the eager response to his paintings from those travels made it clear to him that the public wanted images of ‘exotic’ places. 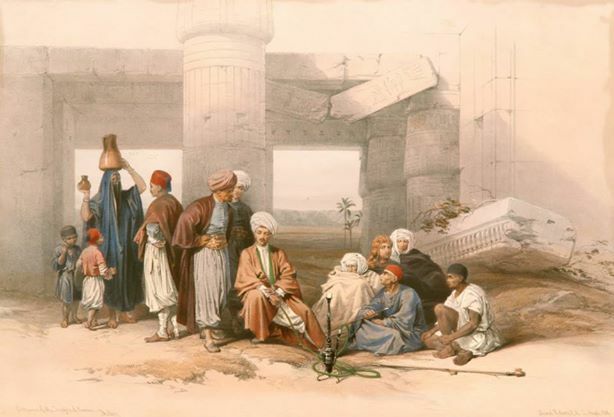 For the next five years, he read extensively to prepare for a much longer trip, this one to the Holy Land and Egypt, and he had enough sales from his oil and watercolor paintings and from book illustrations to depart in August 1838 when he was age 42. Returning to England, Roberts worked with lithographer Louis Haghe, and the result was a six-volume set with 248 hand colored lithographs. The publication was described as “the most ambitious work ever published in England with lithographed plates.” (Petra) Egypt and Nubia were the subjects of the first three volumes, and the last three volumes were devoted to the Holy Land. Sold by subscription in monthly installments, the volumes brought him great professional distinction and were groundbreaking in that they showed living people in contemporary circumstances on ‘ancient’, revered soil. He had found much of the poverty shocking but was much inspired by their cultural heritage. Settling back into life in London in 1839, he was admitted to the Royal Academy and exhibited there for the next 30 years. He established a studio at 7 Fitzroy Street, and remained based there, while continuing to travel including many trips back to Scotland. In London, he was a popular figure with a very active social life. He saw much of his daughter, Christine, and her large family, was a member of the Garrick Club, and was close friends with prominent persons such as Dickens, Thackeray and Landseer. One of his painting projects towards the end of his life was a series of the Thames River. 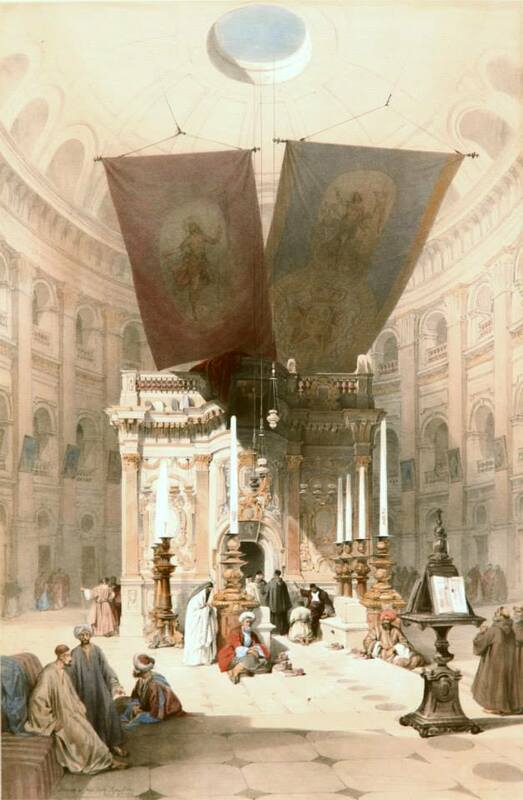 On November 25, 1864, while working one one of these paintings, St. Paul’s from Ludgate Hill, he collapsed and died a few hours later that day. Museums with work by David Roberts include the Fine Arts Museums of San Francisco, National Galleries of Scotland, National Gallery of Canada, Denver Art Museum, Brooklyn Museum of Art and the Courtauld Institute of Art. Portrait and landscape painter he engaged also in the context of gender and oriental subjects. In 1900 he became a member of the Society of Amateurs and Connoisseurs Rome, to whose exhibitions he participated since the beginning of the century (a hot and sunny, Head Rabbi, Head of the Palestinian woman, 1900 at the source, 1904). 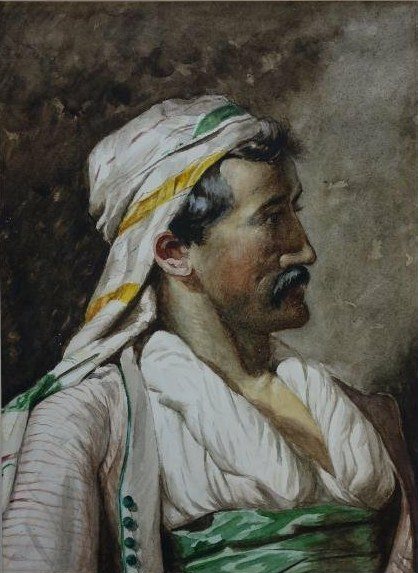 He exhibited with the group “In Arte Libertas” (Hail Mary, 1902) and the Association of Roman Watercolourists (Portrait, Posters, 1908). In 1919 he was commissioned an altarpiece for the church of the Sacred Heart of Suffrage in Rome. Ritrattista e paesaggista si impegnò anche nel quadro di genere e nei soggetti orientali. Nel 1900 divenne membro della Società Amatori e Cultori di Roma, alle cui esposizioni partecipò dall’inizio del secolo (Calura estiva, Testa di rabbino, Testa di donna palestinese, 1900; Presso la fonte, 1904). Espose anche con il gruppo “In Arte Libertas” (Ave Maria, 1902) e con l’Associazione romana degli Acquerellisti (Ritratto, Manifesti, 1908). Nel 1919 gli fu commissionata una pala per la chiesa del sacro Cuore del Suffragio di Roma.